Essentially two of our extra with emergency exits mounted in a common frame. 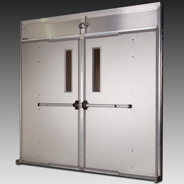 Center pivot mechanism width spring loaded hinges, negates the effect of the internal structure pressure while insuring proper door closure. We offer special adaptations and or designs to meet your specific requirements. A unit specially designed to meet the unique criteria of an air supported structure. Unit is designed to for use in structures operating at pressures up to 2.5” wc. Door is NOT to be used a part of the structure anchorage.